Oculomotor Dysfunction: Does your child skip words or lines while reading? Have you noticed that your child often skips words, sentences, or even several lines of text when reading? Parents often assume this happens because the child isn’t interested or trying hard enough–that they are distracted, lazy, or rushing through their work. When a child struggles to read, you might suspect skipping words is a sign of impatience or frustration with challenging and unfamiliar words. However, in some cases, if a child is skipping words or losing his place when trying to read, this could point to oculomotor dysfunction–specifically, poor eye tracking skills–which can be treated with vision therapy. 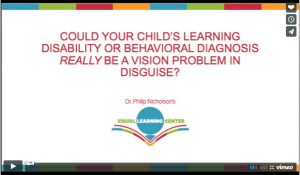 Learn more about how vision affects learning by watching this pre-recorded webinar for parents. A child with an eye tracking problem strains to efficiently and accurately control eye movements. Oculomotor dysfunction causes the eyes to jump or skip erratically, rather than move along a line of text smoothly. You may not notice the irregular eye movement upon observation, but even subtle eye movement deviations can make it difficult to read and write without strained effort. Eye tracking is a very complex process and involves many different areas of the brain. Even with a normal healthy visual system, when we read, eye tracking movements are not smooth scans of the text from left to right. Properly functioning oculomotor movements occur as a series of “jumps” and “fixations” on certain points across the text. With each pause and fixation, we take in either a whole word or part of a word during the brief moment our eyes are stationary. We then decode and send the word through our visual processing system. Then our eyes fixate on the next word, briefly, to decode and process it. If we have normal oculomotor abilities, we’re able to control the eye tracking process without concentrated effort, moving our eyes mostly in a left to right manner across the page, jumping from word to word, sentence to sentence, and around the text as needed. We rarely skip words or lose our place. But if your child is struggling with oculomotor dysfunction, he or she need to use a finger, ruler, or pencil to avoid losing his place. Reading becomes challenging and tiring, because it requires strained effort to simply follow along the text. An eye tracking problem tends to become more pronounced as reading requirements progress and paragraphs get longer, usually in third or fourth grade. If a child is continuing to skip words or sentences, he may have to read and then re-read a paragraph repeatedly before absorbing it in its entirety; so reading comprehension performance slows. To learn more about signs and symptoms of functional vision problems, download our free guide 10 Things You Need to Know About Vision here. If you suspect that your child may be struggling to read due to oculomotor dysfunction, also known as poor eye tracking skills, get a comprehensive functional vision exam by a developmental optometrist. The good news is, eye tracking skills can improve significantly in a relatively short period of time with vision therapy. Click here to read vision therapy success stories. For vision therapy in Silver Spring or Olney, Maryland, click here to schedule a functional vision exam with developmental optometrist, Dr. Philip Nicholson.